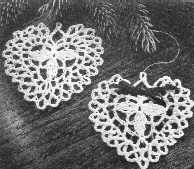 These delicate hearts for Christmas or Valentine's day are made from a small amount of bedspread cotton, size 6 steel crochet hook, 12 inches 1/8 inch satin ribbon and 6 inches fine gold thread. Rnd 1: Ch 5, 4 dc in ring, (ch 3, 4 dc in ring) twice, ch 5, sc in ring. Rnd 2: Sl st in next 4 ch, ch 4, [dc in dc holding last lp on hook, dc in next 3 dc holding last lp of each on hook (5 lps on hook), yo and draw through all lps on hook (Cluster st made), ch 4, sc in sp, ch 4 ] twice. Work Cluster st over last group of dc, ch 4, sk first ch, sl st in each of next 4 ch, sl st in sc, ch 3. Rnd 3: Sk 2 sts, hdc in next st (ch 2, hdc in next ch) 5 times (5th hdc will be in tip of Cluster); (ch 2, sk 1 ch, hdc in next ch) 4 times; ch 2, work hdc in tip of 2nd Cluster, ch 2, dc, ch 2, hdc; (ch 2, sk 1 ch, hdc in next ch) 5 times (5th hdc will be in tip of 3rd Cluster); (ch 2, hdc in next ch) 5 times, tr in joining st of last row - 24 sps. Ch 6. Rnd 4: Sl st in 4th ch from hook (hanging loop made), ch 2, sl st in first hdc, sc in sp, ch 3; tr in next sp, ch 3, crossing behind first tr, tr in 2nd sp between sc and hdc (first Crossed st made); * tr in next sp, ch 3, crossing behind tr, tr in last sp between tr and hdc, repeat from * round, end ch 3, sc in last sp of Row 3, sl st in tr, fasten off - 21 crossed tr. Wet heart with fabric stiffener. Pull into shape while drying. Weave ribbon through spaces, tie bow. Attach gold thread to hanging loop.